Can you feel the magic? 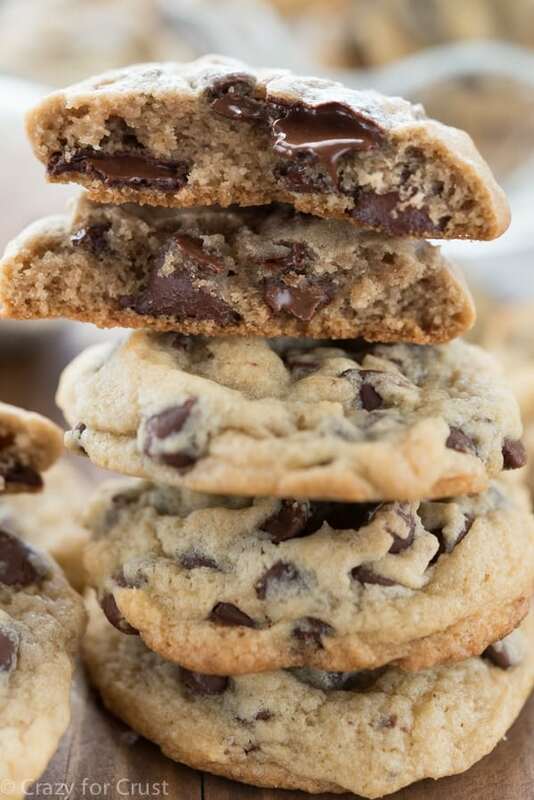 These aren’t just plain old chocolate chip cookies. They’re magical cookies! These cookies are made with ice cream inside the batter! Yes, I totally did that. I put ice cream INSIDE cookies. How awesome is that?? RIGHT??!! Now, if we’re being totally honest with each other, this is not the first time I’ve done this. Except the last time I put ice cream in cookies about 3 people read my blog and my photos were less than desirable. Long story short, no one saw them. So I decided it was time for a revamp because these cookies deserve their day in the limelight. They’re that good. Also, I have eleventy-billion cartons of ice cream in my freezer. Best way to use up ice cream? 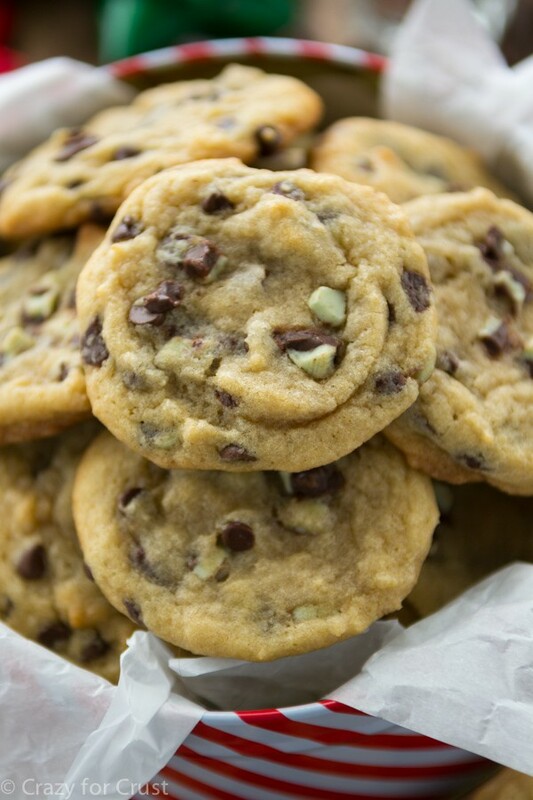 Make it even more fattening by putting it in chocolate chip cookies! It was about a month ago when I was perusing through my archives and was reminded of my original ice cream cookies. As I often do with recipes I made in my first year of blogging I immediately wondered why I thought I was a good photographer, and then I wondered if the recipe actually worked. I mean…it did back then. But back then I really had no idea how to write recipes. You learn a lot in 4.5 years. I made these cookies three times in two days, with three different flavors of ice cream. You guys, I was onto something back then. Not only did the recipe work every time but every flavor tasted the same but oh-so different. These cookies taste like chocolate chip cookies. But then, while you’re eating them, you get another flavor. And if you didn’t know the cookies had mint chip ice cream or strawberry ice cream inside you’d probably think what the heck is that flavor? But if you know the ice cream is there? You can totally taste it. And it totally changes the cookie for the better. I used my favorite chocolate chip cookie recipe of all time for these cookies. The only difference is that I did not brown the butter. I was just too lazy to do that. But you totally could! The trick for adding ice cream to cookies is to replace some of the butter and some of the egg with ice cream. My original recipe calls for 1 cup of butter and 2 eggs. This recipe has 1/2 cup butter, 1 egg, and 1/2 cup of ice cream. The science works, trust me. When measuring the ice cream, I used it cold straight from the freezer. I just packed it into my (dry measure) measuring cup. You can use any flavor ice cream, but I recommend that you use full-fat regular ice cream (not reduced fat ice cream or frozen yogurt). I did not test this with anything but regular ice cream. 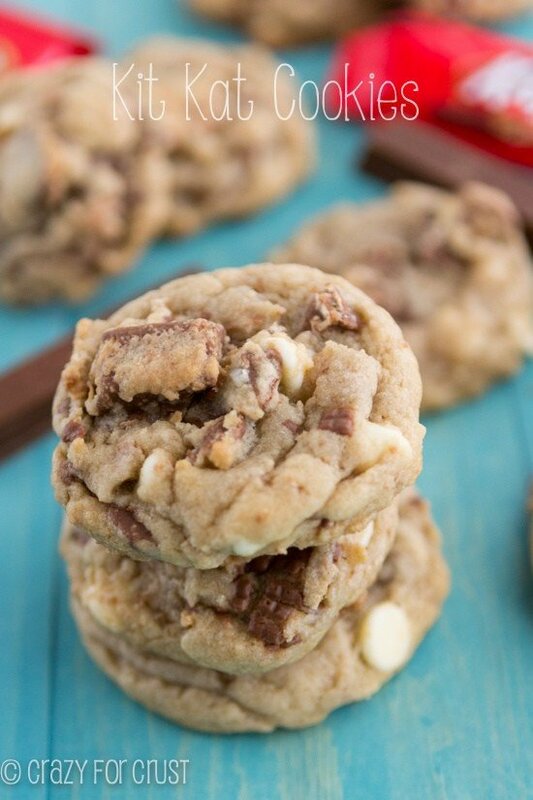 Once your dough is mixed together, it’s just like a regular cookie dough. Because the dough starts with melted butter you need to chill it before you bake it. My favorite way to do this is to scoop your cookies (I used a 2 tablespoon sized cookie scoop) onto a cookie sheet, no need to space them out. Wrap them with plastic and chill the dough for at least an hour (or longer is fine too). When you’re ready to bake, space them out onto cookie sheets. Chilling the dough lets it rest and lets all the flavors melt together and it also gives you that crunchy exterior and soft interior. I love a gooey soft cookie and these are totally that. They stay soft for days! And they taste like ice cream. That’s pretty much the perfect cookie right there! Ice cream and cookies. Now that’s a combo I’m going to make for years to come. What flavor ice cream would you use? 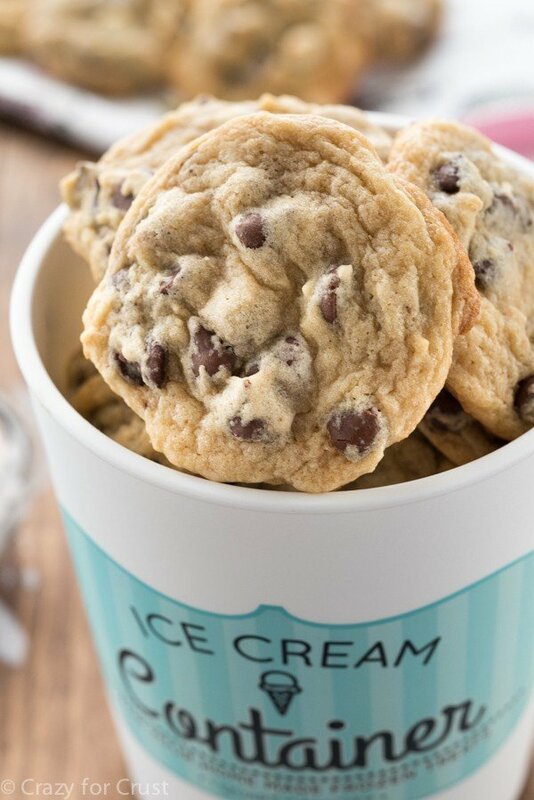 These Ice Cream Chocolate Chip Cookies have your favorite flavor ice cream IN the cookies! I substituted some of the butter for ice cream and the result is the perfect cookie with a hint of the ice cream flavor! Melt butter in a microwave safe bowl. Pour into an electric mixer fitted with paddle attachment. While still hot, add both sugars and mix on low until combined. Add ice cream and mix until smooth. Add egg and vanilla extract, mix for just a few seconds, then add baking soda and salt. Mix until smooth, then mix in flour slowly. Mix dough just until it comes together, then stir in chocolate chips. Scoop 2 tablespoon balls of dough onto a cookie sheet covered with wax paper. You’re going to chill the dough balls so there is no need to space them out. Cover with plastic wrap and chill for at least 1 hour. Preheat oven to 350°F. Place cookies 2” apart on cookie sheets covered with parchment paper or silpat baking mats. (If you've chilled them longer than 4 hours you might want to press them down slightly with the palm of your hand otherwise they won't flatten totally.) Bake for about 9-11 minutes, until they start to get golden around the edges. Cool at least 5 minutes on cookie sheets before moving to a rack to cool completely. Cookies can be stored in an airtight container for up to 4 days or frozen for up to 1 month. 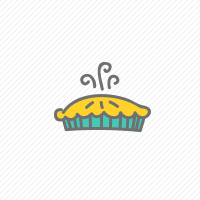 Good for you for redoing an old recipe and post…it’s been on my list of things to do…so far only 2 have gotten done. Eventually, right? I love that you added ice cream to the cookies. I bet they tasted amazing! I have done ice cream in cake, donuts, and scones…I definitely need to try it in cookies next!!! Again with the genius use of ice cream! These look amazing. And I totally get what you mean about testing and retrying old recipes. I’ve only been doing this a year and continue to learn more every day! These are WAY TOO FUN!! 🙂 I bet they taste just incredible…I’ve gotta make these happen in my kitchen asap!! Pinned! It is so cool that these are made with ice cream! How fun is that! It would be fun to try with different flavors of ice cream too! These cookies are genius. 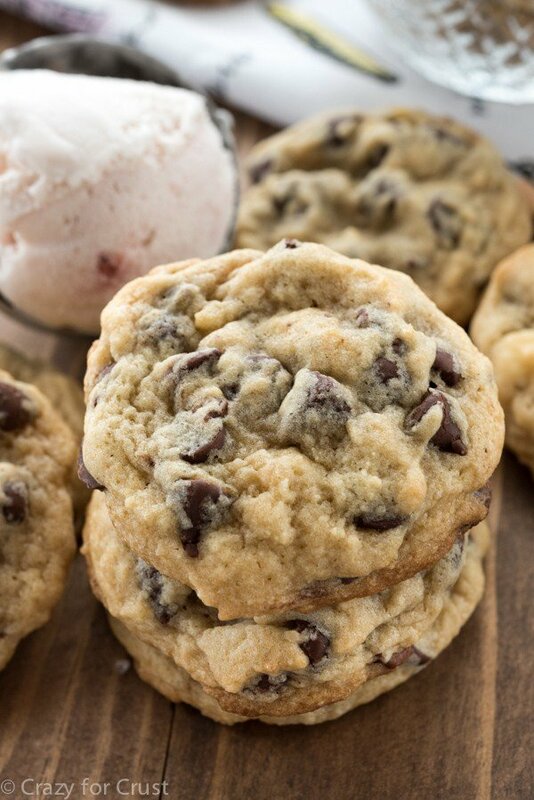 Ice cream in a cookie is the best of both worlds. I really want to try this with chocolate chip cookie dough ice cream, is that bad or what? Your description is killing me – a chocolate chip cookie but so much more? Um yes, please, and thank you! Pinning! 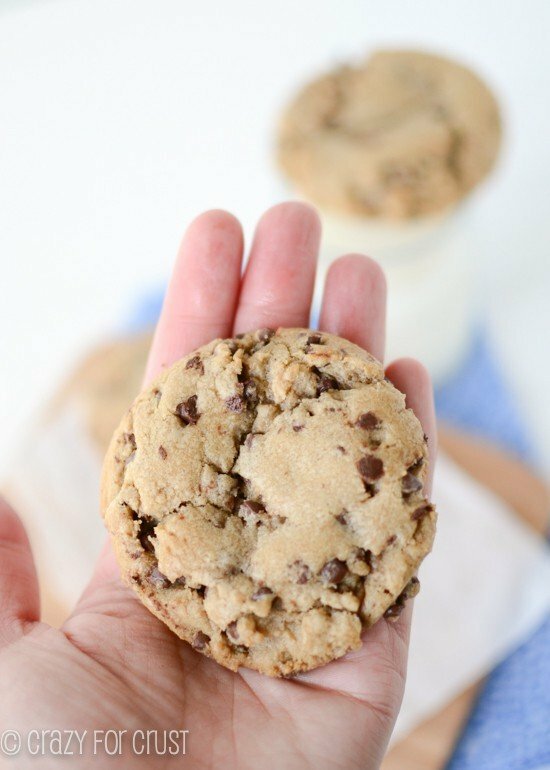 Do you recommend making these with solid ice cream only, or would ice cream with add-ins (like rocky road or cookie dough or half-baked) work as well as solids? Also, what is the consistency of the ice cream when you add it to the dough? You could use ice cream with add ins if you like, that shouldn’t be a problem. The ice cream was straight from my freezer, measured, then added to the batter! Ummm seriously?? This is GENIUS! Pinning ASAP. omigosh all I want is to make these with hazelnut or salted caramel ice cream or some such!!! I just took these out of the oven! They are delicious and very easy. I added some condensed milk because I didn’t quite have enough ice cream and replaced 1/4 cup of flour with almond meal.